Celebrate your or your loved one's first sober birthday. A dressy casual kind of piece with a very unique butterfly knot that sets off the round medallion beautifully. The genuine leather cord is warm and comfortable against the skin. Medallion necklaces are suitable for both men or women. laser engraved in my workshop rendering a permanent dark mark. 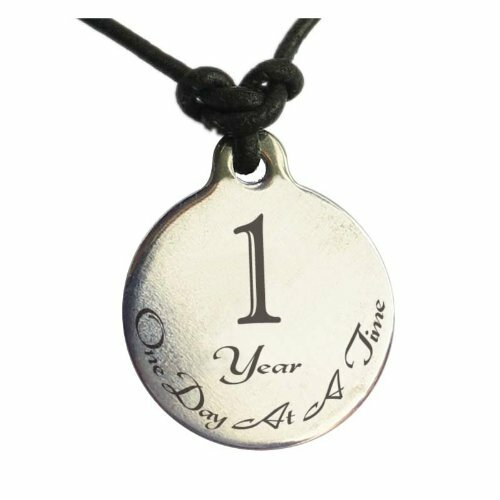 Necklace reads: 1 Year, One Day At A Time. If you have any questions about this product by Serenity Is Forever, contact us by completing and submitting the form below. If you are looking for a specif part number, please include it with your message. Men's 14k Yellow Gold Solid Diamond-Cut Rope Chain Necklace (3.0mm), 20"